Previously, on MinerBumping... Agent Kalorned rolled up his sleeves and ventured into the wildlands of Gamis, which had mostly been untouched by civilization. He deployed weapons against the rebel carebears that they were unable to cope with: bumping and ganking. Kalorned > Evening Project K2O Huricane Maulerant , are you AFK? I don't need to tell you what happened three minutes later. I'll just show you. Two hostile Retrievers, out like a light. Then the silent Huricane Maulerant found his tongue. Isn't it funny how, when a highsec miner dies, that's when he becomes most alive? Poppins Kautsuo > whatd ya loose? Huricane was furious at Kalorned, but he seemed to direct some of the anger at himself, as well. He "should have known", indeed. The formerly ignorant carebear was filled in on his responsibilities under the Code. We may not be "fuckers", but Agents of the New Order are just. Many moons ago, legendary miner The Wis expressed suicidal thoughts after losing a dozen Mackinaws in one attack. Huricane's loss of two Retrievers wasn't in the same ballpark, but it was enough to give him a case of the blues. Kalorned provided a sympathetic ear. Kalorned > Why, because some people enforce the law that you chose to break? When miners get passive-aggressive and self-pitying, it's important to remind them that they're not helpless. They have the ability to follow the Code and avoid being ganked. Thus, their fate is in their own hands. Huricane Maulerant > What law did i break? Despite having been told about the Code just a few minutes earlier, Huricane expressed surprise at being told that he'd broken a law. He was distracted or something, I guess. If you hang out with a crowd of bot-aspirants, it will have a deleterious, desultory effect on you. If you spend time with an Agent of the New Order, everything about your life will improve. Our goodness has a way of rubbing off on people. Now it was Huricane's turn to benefit. Huricane Maulerant > give me some positives of what you are doing? The miner made a rare confession: He was frightened by the extent of the New Order's impact on the game. Many carebears are disturbed by how much influence we've had. But Kalorned was a trained Agent, and ready to defend the changes we've caused. Faced with the truth, Huricane was still a little skeptical. No problem. Agents of the New Order are never afraid to prove by their actions exactly what kind of people they are. Kalorned spied a Covetor piloted by Grtiger. Kalorned's spidey-sense went wild. He knew, instinctively, that Grtiger's crimes were a sensitive matter. Only after the punishment was delivered should it be publicized to the rest of Gamis. Ross Taylor > heads up miners!!! Ross Taylor > krominal undocked! The local hooligans hooted their primitive warning cries. Alas, the warning, falling upon AFK ears, went unheeded. KABOOM. 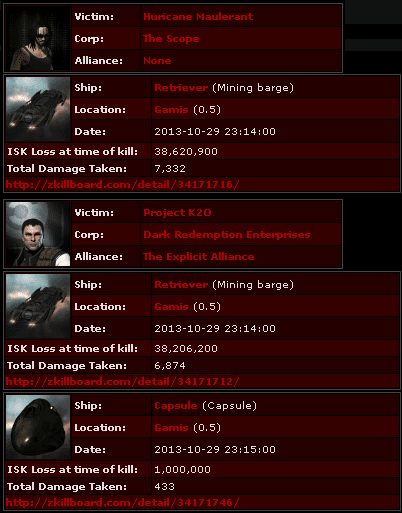 Grtiger's Covetor revealed a juicy pod, valued by ZKillboard.com at 3.6 billion isk. Grtiger's covetousness had gotten the better of him. He thought he could take shortcuts by plugging in some expensive implants. He was wrong. In highsec, the New Order has jurisdiction over your brain and every piece of equipment plugged into it. But how would the locals react? Would they call Kalorned a war criminal? Actually, the local miners were impressed. And they softened to the Order, a bit. For many of the brutes, power is the only language they understand. It's a good thing the New Order has plenty of that to spare. Satisfied by a job well done, Kalorned prepared to retire for the evening. He'd earned a rest. Of course, when it comes to saving highsec, an Agent's work is never done. That doesnt sound like part of a nutritionally balanced breakfast. So were you Grtiger, Hurricane, or Project? Nice pod. 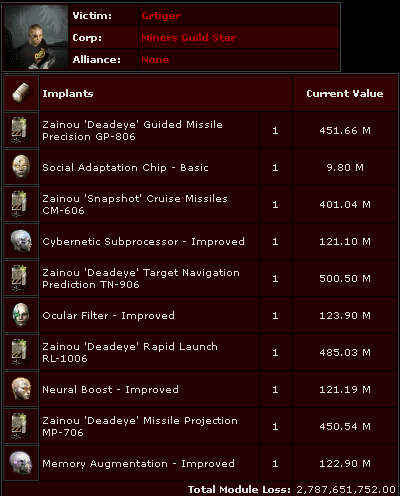 Though I disagree with Kalorned's assessment of the +6 implants as PVP implements; they look like damage & damage application enhancements for a missioning CNR to me. Basic social adaptation says it all. Maybe he thought those other expensive implants would help him mining somehow. Carebears aren't generally the sharpest tools in the shed. Nice triple kills Kalorned, very impressive! Nice? Yeah, way to gank. How pathetic to take a victory lap after shooting down someone unarmed. Idiots. Unarmed? They had Concord. I guess you never tried to suiced gank cause you don't understand the difficulty of it. By the way, insulting other players for no reason makes you the pathetic one. Huricane Maulerant > Look im not going to lie, i mad..
Actually, you tried to do that but I blew up your ship and the war has failed.